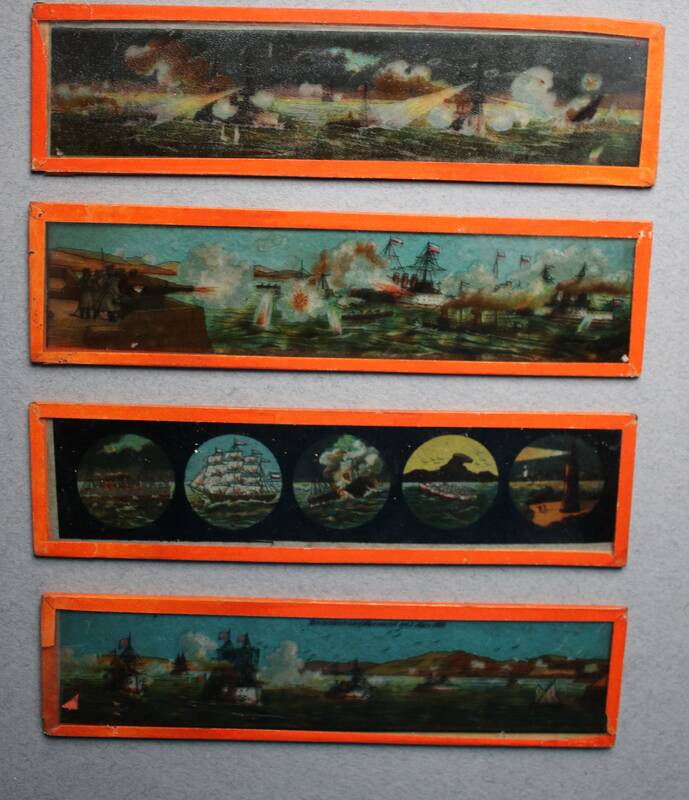 These four, nautical-themed, glass magic lantern slides are circa late 1800s and are from a purchased lot of German magic lantern slides. There is German script on two of the slides, although it is mostly illegible owing to wear on the slides. This type of slide was typical of German production. They are more than likely printed decals, and the edges are secured with orange material so as to render them safe for little hands. The slides have some areas of wear on the glass, and one side is smooth and the other rough. (See all photos.) Please do examine all of the photographs, use the zoom function, and request more photos from me if necessary; I'll be happy to oblige. I've not attempted to clean these although water and a tissue with a light touch should remove any soil. Care should be taken as any abrasiveness will result in damage to the slides.